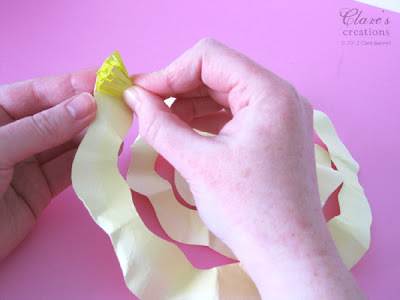 Here's that tutorial on how to make a shabby rolled spiral flower. There's just a couple of variations on your regular spiral flower so it's not too tricky! Here we go! So start by drawing a circle on your piece of card (I used a 220gsm weight sheet of lemon card but you could use lighter) draw a spiral. 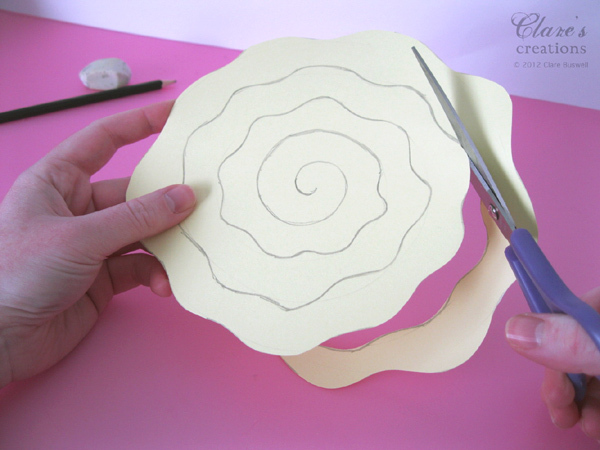 (I'll include a template at the bottom of the post for those of you who don't feel confident in drawing a spiral) My circle was 8" wide, this makes a 2 1/4" flower. 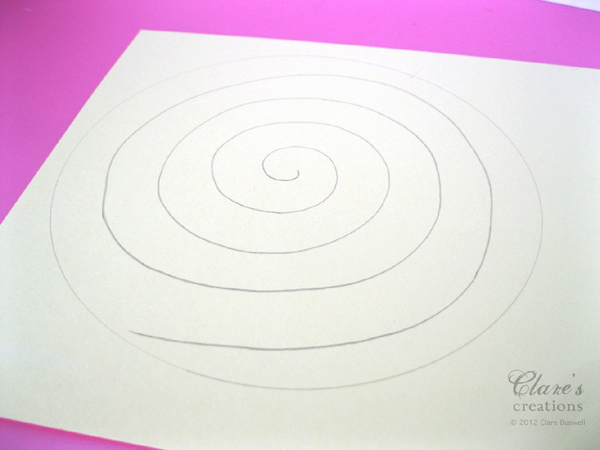 Draw a wavy edge along the spiral lines apart from the last bit in the centre. 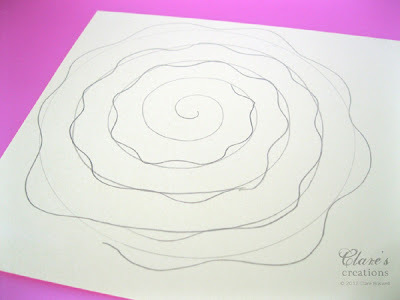 Once you are happy with your spiral it's handy to trace it onto tracing paper for future use. Rub out the straight pencil lines leaving just the wavy ones and starting on the outside cut out your wavy spiral. Rub out any remaining pencil lines with an eraser. Be careful not to tear the card. 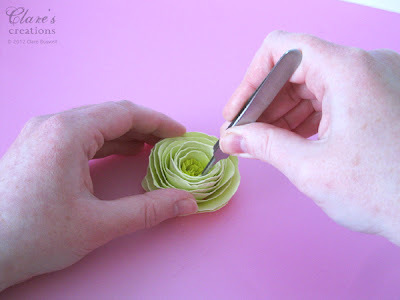 On the outer edge of the spiral create a fringe with a scissors, just as far as two and a half waves on the outside. You can have less fringing if you want a smaller centre. So your spiral should look a bit like this at this stage. 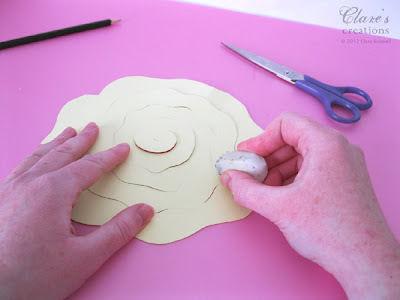 Now color your fringed centre by rubbing with an ink pad or blending chalks, I used a small ink pad here. You need to color both sides of the fringing! To create a nice tonal effect on the tips of the flower you can rub a white ink pad (or whatever color you like) along the outer edges of the spiral front and back (you can't really see it well on the lemon but it works very well on darker cardstock). Now for the most terrifying part, scrunch it up in a ball (but not the fringed part!). 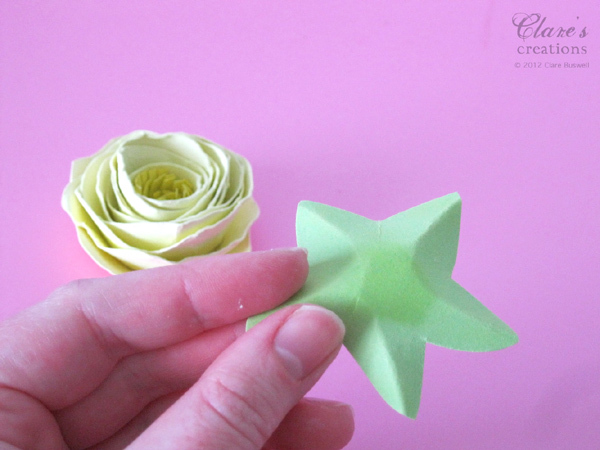 This part may seem crazy but it gives the nice soft, shabby effect to the finished flower! Be careful not to tear the card when scrunching! Flatten it out a bit, back into the spiral shape, ready for rolling! 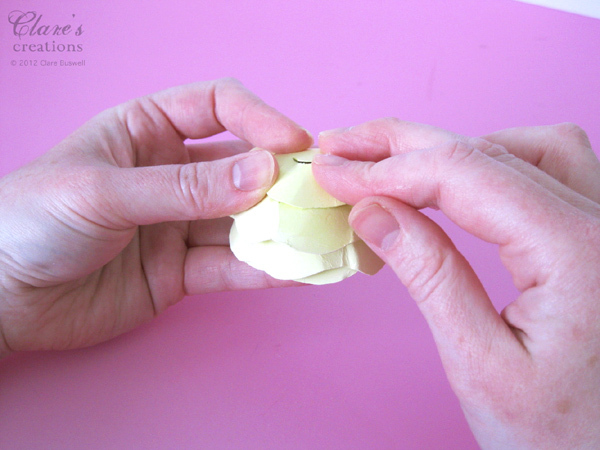 Begin rolling up the spiral from the outside, keep it fairly tight and even. Keep rolling all the way to the end of the spiral. Then let go and start to loosen out the spiral until you are happy with the size and shape. 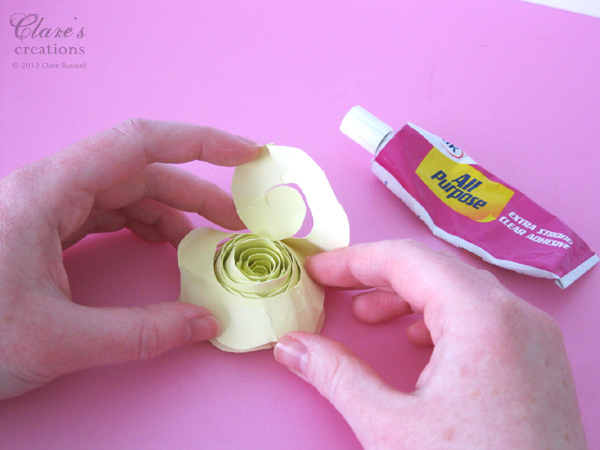 Now add a generous amount of a strong craft glue to the back of the flower. Press down firmly and shape to the flower. Hold for a few seconds. 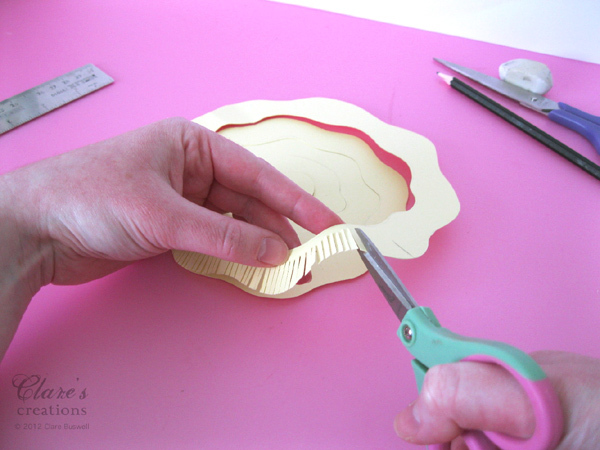 While the glue is still wet make any necessary adjustments with a tweezers (making sure the centre is in the middle!) and you're happy with the shape and look. 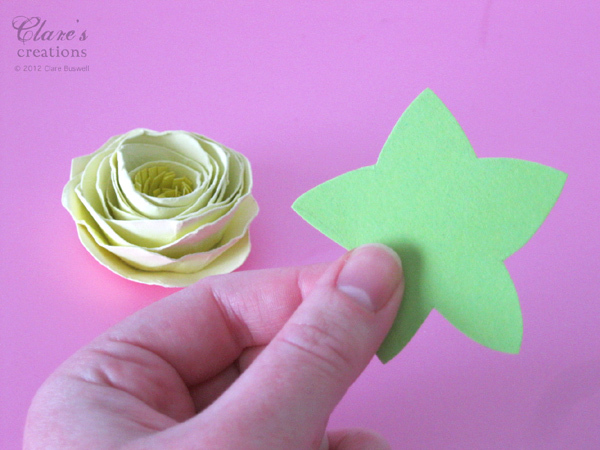 To add a little foliage and neaten the base of the flower I cut out this basic shape, it's include in the template at the end of the post. 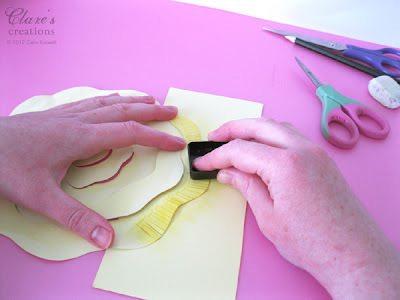 Pinch the middle of each section and ink with white ink or Distress Ink depending on the look you're going for. 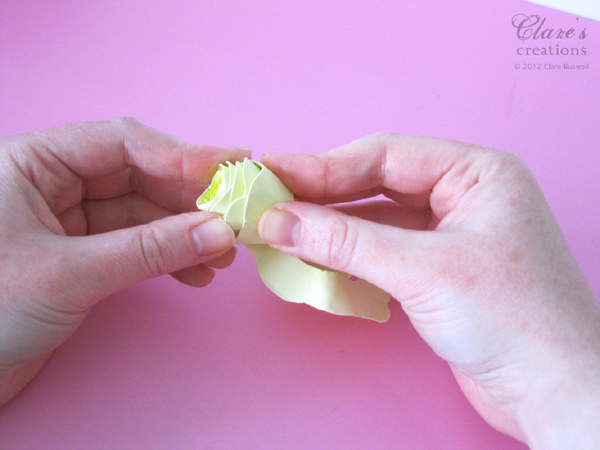 Glue to the base of your flower and that's it. You can add a stem to these flowers by piercing a hole in the centre of the foliage and adding some florists wire with a L shaped bend at the top, then glue to the flower base. 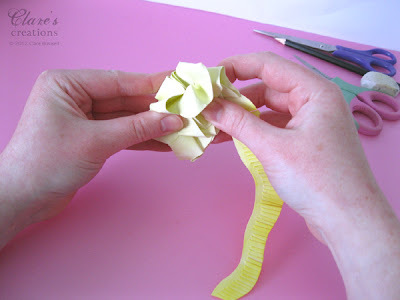 Here I made a paper bouquet of these flowers with wired stems but they're great on cards and for embellishing gifts too. 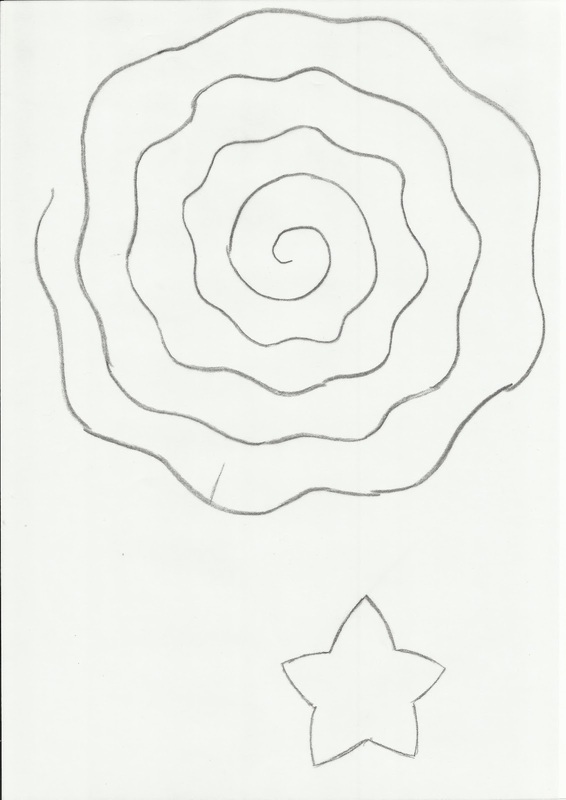 Below is the rough template I drew to make a 2 1/4 inch flower, the spiral is 8" wide, you would need to resize this for bigger or smaller flowers or have a go at drawing your own. The foliage shape is included. 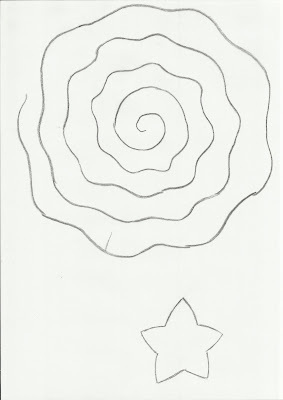 The line marked on the outer section of the spiral is the point I fringed to. 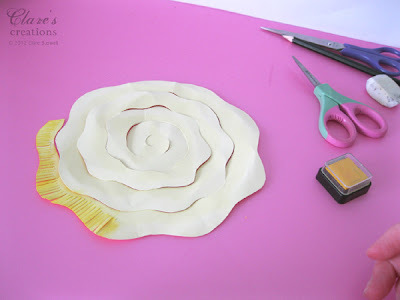 Your spiral really doesn't have to be perfect to make these flowers! They really are fun and quick to make. I hope you give them a try! Fabulous tutorial and a wonderful template for those of us not quite so brave. Thank you. These are absolutely gorgeous! Thanks so much for sharing your technique. Thank you, Clare! LOVE how this turned out, and you can't have too many flowers! Thanks for your wonderful step-by-step directions! Love the fringed flower center! I've seen so many flower tutorials but this is the one I want to try! Thank you!! Thanks for this! I am excited to try it! The tutorial is so much appreciated! I love your card in the previous post and thought your flower was quite lovely! I especially like the center! 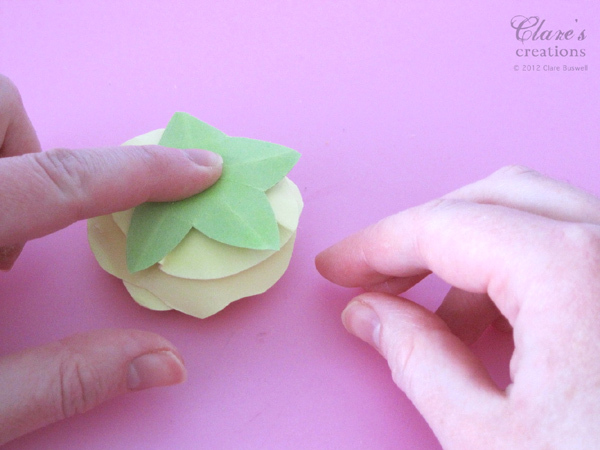 Another wonderful tutorial. Thank you! 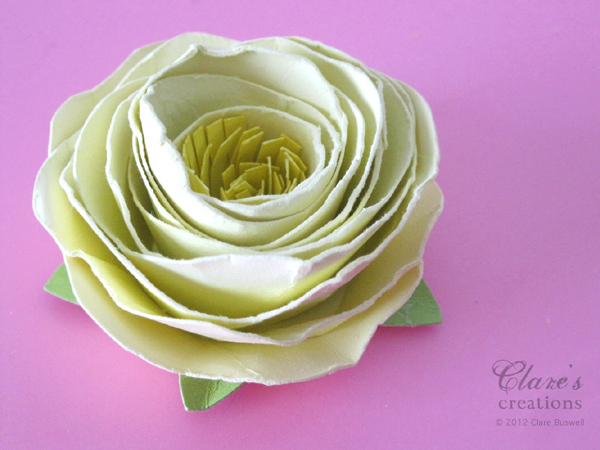 You really are one cool crafter! Thanks so much for taking the time to do this tutorial. I certainly will try it. It looks very easy. Your flowers are gorgeous. wow, these are so beautiful, thanks so much for the tutorial. 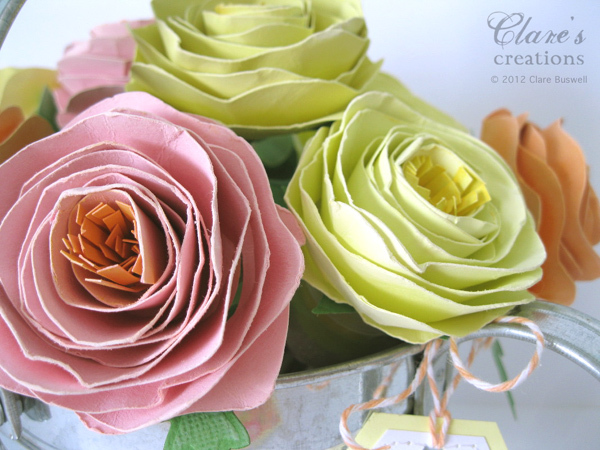 Love them..Thank you so much for this super tutorial Clare..i have been thinking about bying a die for the flowers..now don't need to anymore..LOVE it! 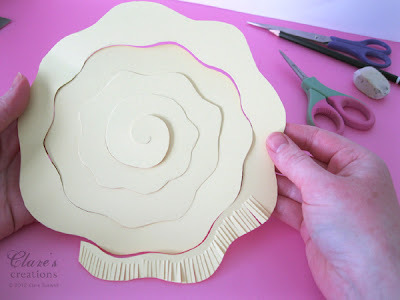 Thanks so much for the tutorial Claire and for the template - I'm rubbish at drawing spirals (or any other shape actually) but will definitely give this a go now you've done the hard work! Had to give this a go straight away and its brilliant. 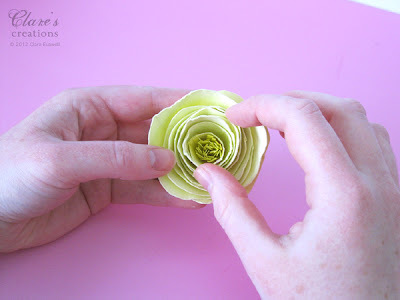 See for yourself at my blog here http://margiesbluehouse.blogspot.co.uk/2012/04/shabby-rolled-spiral-flower.html Thanks so much Clare, you're a star. Fantastic tutorial!! And absolutely beautiful blooms. Thank you for sharing this technique! So, so ... SO clever and pretty!!! Wow, very cool Clare! I thought you BOUGHT the flower on your card for CP. Great tutorial. Such a gorgeous rose! Thank you so much for the tutorial and template...it was very sweet of you!!! This is just awesome! I love it. Thanks for the tutorial! Great great tutorial! 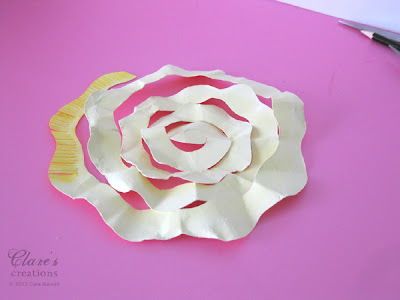 Love this variation of the flower! Looks awesome! i like the variation among flowers. Great idea with the core! merci tres bonne idée ! Just what I've been looking for!! TFS! Waltzingmouse Stamps April Blog Party!! Nina B Designs - 2nd Blog Hop!